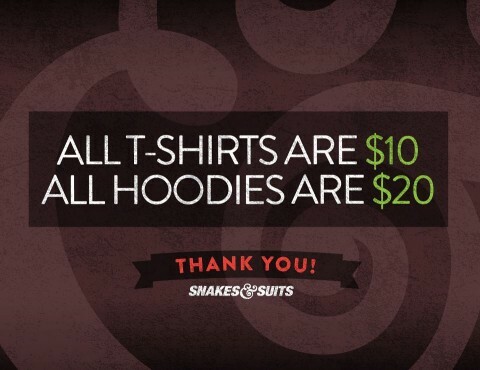 Its a sad day in the indie tee world as Snakes & Suits have decided to close up shop after 5 years in the game. Snakes & Suits was one of the first brands I ever covered on IATT and a brand that I have admired over the years. 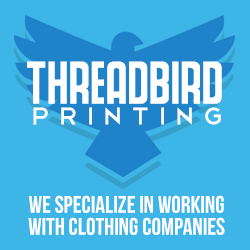 I was also lucky enough to be their screen printing rep at Threadbird for the last few years! Well sad stuff aside, everything over at Snakes and Suits is drastically marked down with all tees at $10 and hoodies at $20, so make sure to swing by and stock up! After 5 years of hard work, we regret to inform you that the adventure known as Snakes & Suits will be coming to an end. We created Snakes & Suits as lifelong friends and we will end the same exact way. Our lives have all taken on new paths and we feel it would be a disservice to the brand and to it’s fans to continue on while not being able to give 100% focus back into it. We are very proud of what we were able to accomplish. Looking back on the last 5 years, the thing we’re most proud of is that the company became much more than a clothing brand. It became a symbol for friendship and support. Some of our closest friends and supporters sport life long tattoos reflecting that. Endless respect to all of you. Thank you to all our friends, family and most importantly, the fans. You’ve changed the lives of 3 individuals more than you know. Best of luck to each of you in you own endeavors. All remaining items have been reduced in price as a thank you and a chance for anyone interested to grab the last pieces of our existence. All shirts are $10 and all sweatshirts are $20. I wish Johnny, Eric and Tony the best moving forward! Ugh – Sad day indeed.